Tickets for the Weber Cup’s American debut will go on sale at 10am PT on Monday, February 4 priced from just $20 per session via AXS and at www.webercup.com. 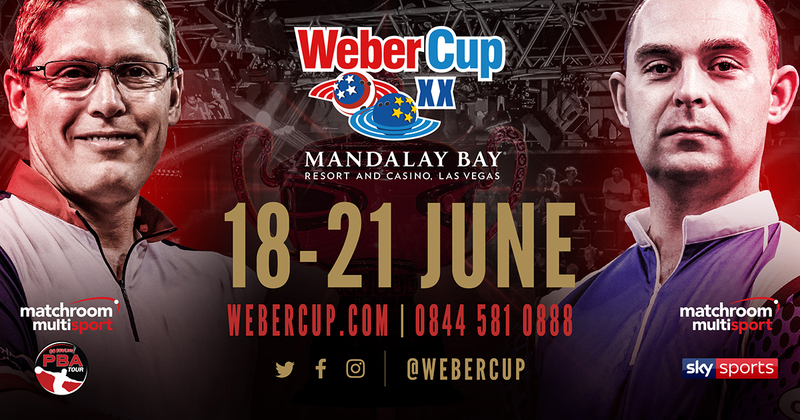 The 2019 Weber Cup will be staged at Mandalay Bay Resort, Las Vegas from Tuesday, June 18 until Friday, June 21, the first time the tournament has been hosted outside of Europe. The 20th staging of the annual transatlantic tenpin tussle will see America as defending champions against a European team who will still be reeling after suffering a first Weber Cup defeat since 2012 when they went down 19-10 to USA in Milton Keynes in June. The tournament will be played over four days from June 18-21 with tickets priced at $20 per day plus fees. A season ticket for all four days will be available priced $65 plus fees. Seating for all four sessions will be unreserved and play will begin each day at 11am, finishing at approximately 3:30pm. Chris Barnes will return to captain Team USA with Dom Barrett back at the helm of Team Europe. For the first time, the top American player and the top European player on the 2019 PBA Tour Points list will earn automatic qualification to play on their respective team at the 2019 Weber Cup. The remaining two players for each team will be chosen after the Points List concludes on April 1st. Matchroom Multi Sport COO Emily Frazer said: “We are excited to be taking the Weber Cup stateside in 2019 and are delighted to be working with both the PBA and Mandalay Bay Resort. “The Weber Cup has always had a loyal fanbase in Europe and we hope that many of those supporters will join us in Vegas and be joined by a raft of US fans who will finally be able to see this great event in American. Tickets for the 2019 Weber Cup will go on sale at 10am PST on Monday, February 4th at www.webercup.com.